The race for Miami/Dade’s State Representative District 111 seat has resulted in a lawsuit filed by a candidate against his Republican primary opponent. Eduardo “Eddie” Gonzalez, an incumbent state representative, recently sued his primary opponent Maykel “Miguel” Balboa, and several others allegedly connected with the Balboa campaign, for intentional infliction of emotional distress and defamation. The lawsuit also asks the court to order removal of Balboa’s name from the August 14th primary ballot. Among other allegations, the suit states that a political consultant for Balboa recorded a widely distributed robocall message which falsely stated that Gonzalez was being investigated for absentee ballot fraud, and that he does not have the support of U.S. Senator Marco Rubio. As of August 6th, Balboa has not responded to the suit and no hearing has been set by the court on Gonzalez’s claims. 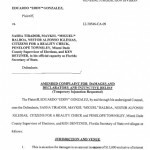 This entry was posted in Candidate qualifications, Election contests, Litigation Updates, News and tagged Eduardo “Eddie” Gonzalez, Flordia election controversy, florida election attorney, Florida election disputes, Florida election law, Florida election lawsuit, florida election lawyer, Florida election suit, intentional infliction of emotional distress, Maykel “Miguel” Balboa, State Representative District 111, Thomas Shults, Tom Shults. Bookmark the permalink.